Home PowerShell Security SharePoint SharePoint 2010 SharePoint 2013 SharePoint 2016 How to Change SharePoint Farm Account Password using PowerShell? How to Change SharePoint Farm Account Password using PowerShell? What is SharePoint farm account, BTW? Well, SharePoint farm account is a service account manages farm services, Used as the application pool identity for Central Administration, used for database access and in used to run SharePoint Timer service! In certain circumstances, You may have to change the Password of SharePoint Farm account, such as: Security Policies, Account has been compromised, SharePoint Admin left, etc. How to Change SharePoint Farm Account Password? If the Farm account's password is already changed in Active Directory, You'll have to update the Farm account credentials in SharePoint. We use the STSADM command line tool to change Farm account password in SharePoint 2007 days: Stsadm -o updatefarmcredentials -userlogin "Domain\FarmAccount" -Password "Farm-Account-Password" . Starting SharePoint 2010, updating Farm Account's credential can be either from SharePoint Central Administration site or using PowerShell. How to update the farm account credentials through Central Administration site? Click on "Edit" icon next to the SharePoint Farm account. Enter the password (password which is already changed in AD) of the account and click on OK to update the password of SharePoint farm account. 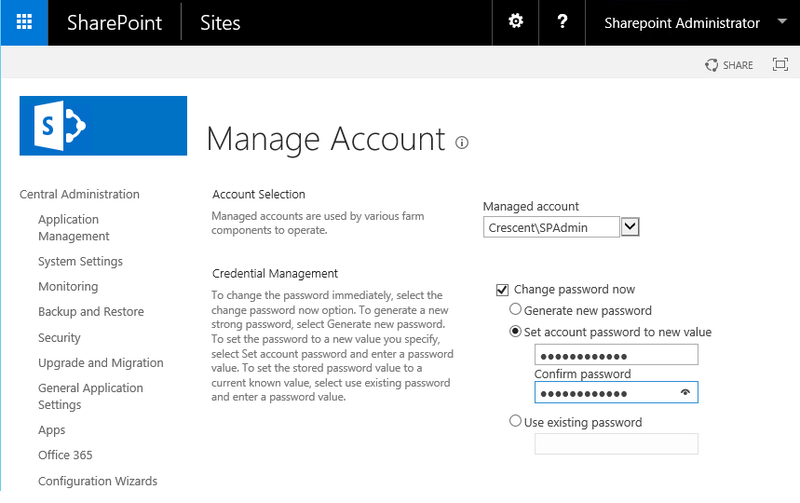 This updates farm account password in SharePoint 2016. To sync the password change to SharePoint, run this PowerShell script. $FarmAccount = Read-Host "Enter the Farm Account in Domain\User Format:"
Lets say you want to change Farm account's password to a new password from SharePoint (Password isn't already changed in Active Directory). Enter the new password and click on OK to change the password of SharePoint farm account. Additionally, You may have to check in these items, but not limited to (In case, You used the Farm account in these places): User Profile Synchronization Service, Workflow Service Account, any Secure store stored credentials, SQL Server Service account. 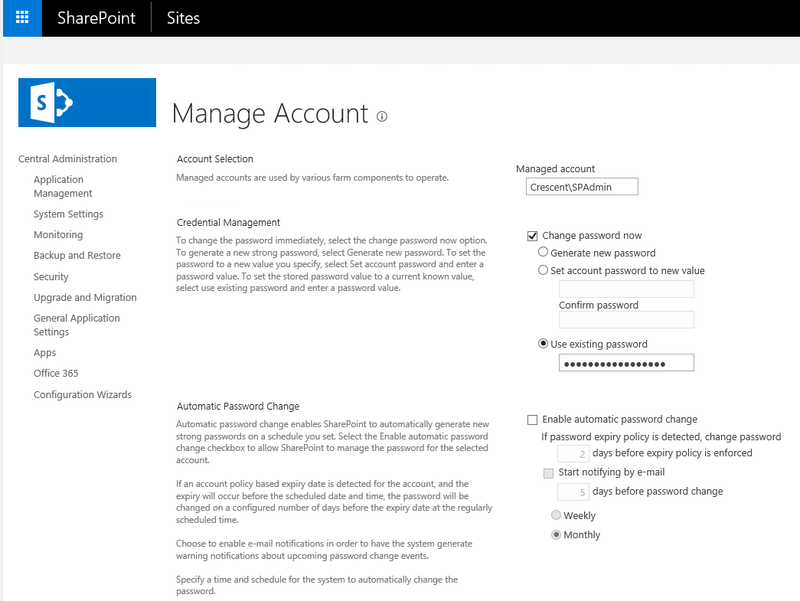 Do not set the option for auto change Farm account (SharePoint automatically changes to random password)! You'll need Farm account credentials every now and then in your SharePoint Farm Administration.